We present an upper bound for the height of the isolated zeros in the torus of a system of Laurent polynomials over an adelic field satisfying the product formula. This upper bound is expressed in terms of the mixed integrals of the local roof functions associated to the chosen height function and to the system of Laurent polynomials. We also show that this bound is close to optimal in some families of examples. This result is an arithmetic analogue of the classical Bernštein–Kušnirenko theorem. Its proof is based on arithmetic intersection theory on toric varieties. Martínez and Sombra were partially supported by the MINECO research projects MTM2012-38122-C03-02 and MTM2015-65361-P. Martínez was also partially supported by the CNRS project PICS 6381 “Géométrie diophantienne et calcul formel”. 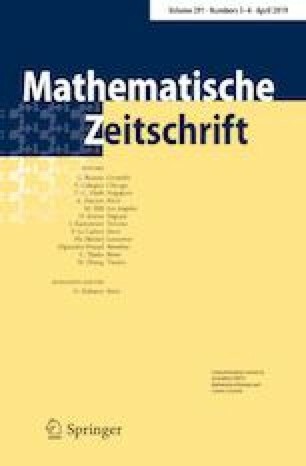 Martinez was also partially supported by the Deutsche Forschungsgemeinschaft collaborative research center SFB 1085 “Higher Invariants”. We thank José Ignacio Burgos, Roberto Gualdi and Patrice Philippon for useful discussions. We also thank Walter Gubler, Philipp Habegger and the referee for their helpful comments and suggestions for improvement on a previous version of this paper. Part of this work was done while the authors met at the Universitat de Barcelona and at the Université de Caen. We thank both institutions for their hospitality.